Day one of the exodus from Egypt: God brings Israel through the Red Sea and then crushes the pursuing Egyptian army, miracles which cause Moses and Miriam to sing beautiful songs in praise of God’s deliverance. All the people of Israel join in with tambourines and dancing and suddenly it’s the incarnation of Woodstock (only it’s spiritually and sexually pure and substance free). The people were high on freedom, on redemption, on a God who did not forget them, a God who intervened to save the lowliest of people. A spontaneous concert seems like a fabulous use of time after being rescued from 400 years of slavery, exploitation and racial injustice, right? Three days later Israel grumbles because there is no clean water. God, in his unmatchable goodness, has Moses throw a piece of wood into some bitter water, which transforms instantly, clean and sweet. God then leads Israel to a place with twelve fresh springs and 70 shady palm trees. They didn’t ask for shade, but God gave that as bonus. Hope seems restored and Israel continues to follow God. What cynicism! What petulance! But does God ignore Israel’s complaint as he probably should? No. God begins a regular provision of quail (meat) at night and manna (bread) in the morning. His deliveries are so reliable and abundant, there is no need to stockpile. Their complaints silence as their bellies fill. This pattern plays out again and again in the wilderness chapters of Israel’s history. It doesn’t seem to matter that God provides everything the people need. Enough is never good enough for Israel. This people — whose very name signifies that they are contenders, fighters, soldiers of God who have overcome — quickly burned through the fuel of redemption and the energy produced through praise and became a people of grumbling and wailing. Maybe it was their new, desert surroundings (which we might consider space) or the lack of grueling physical labor (which is rest), or the absence of an army chasing them down (which is peace), or the loss of a stationary home, even if it was a rental (which is freedom) – maybe this was all too much provision for the 16th generation of spoon-fed slaves to handle? That a handful of root vegetables and fruit could have the power to make a miraculously rescued race of slaves crave the life they had in Egypt! How ridiculous is this thought – we may have been slaves, but at least we had onions! Do you hear my sneer? Do you feel the arrogance starting to curl your lips when you hear Israel’s story? That is how I used to regard the people of Israel. I thought they were foolish, so fickle, and very beneath me. I thought that until I entered my own desert, experienced deprivation, and stumbled into a barren soulscape where the horizon was a never-ending maze of shifting sand. Now I understand. Now I realize that for all my lofty self-assessed spirituality, I’m just another Israelite. I have a roof over my head. I have a job, income, benefits, a loving family, faithful friends. In fact, my list of blessings is quite long. Like the Israelites, I have everything I need to survive. But I still want more. I want a job that I love, not just a job that I do. I want savings rather than subsistence. I want to use my pastoral gifts and be able to support myself with them, but it seems that only my male counterparts get that privilege. I want to live out my calling but so far this promised land is more than beyond my reach, it’s beyond sight and increasingly unimaginable. Some days I feel like I’ve been tricked and that the church, or worse, that God is the trickster. I’m often ashamed at my lack of trust in God. When I’m able to offer myself grace, I remind myself that I’m human. That it was inevitable that I would tumble off the spiritual pedestal I built. I try to encourage myself that the desert is a harrowing path but it’s just that — a path, not a destination. On bad days, I complain. On good days, I praise. Some days I teeter from praise to complaint in a matter of minutes. I console myself with the story of my capricious ancestors. I’m really am just another Israelite doggedly following the dusty trail of an unlikely promise, while being simultaneously tugged in the opposite direction, seduced by the pungent memory of a kind of security. I’m not writing this for sympathy or attention or so I’ll get a lot of encouraging comments. (In fact, if you feel the need to comment, find a way to say that you know what I’m talking about.) 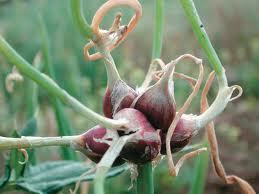 I’m writing about my own stinking onions because my soul needs to be real. If I succeed at being any kind of pastor, I want to be an honest one, so here is my honesty. Following God is hard enough when life’s a garden. But when life looks more like a dung heap or a black hole, a tar pit or a desert, faith is nearly impossible.